Elano arrived in Manchester for a hefty £8m fee back in 2007 and instantly made an impact by assisting Rolando Bianchi on the opening day against West Ham United. I guess it’s safe to say the Brazilian had a dream start at City, hitting wonder goal after another while enchanting Blues fans with his Brazilian magic. 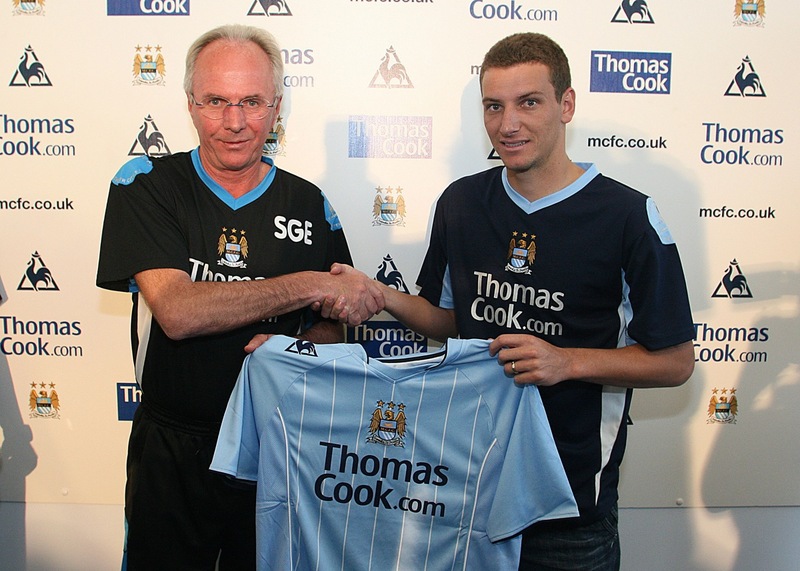 Elano quickly established himself in the team and was crucial to the early success of Sven Goran-Eriksson’s Manchester City revolution. His intricate use of possession and his ability to strike a dead ball so well meant Eriksson was heralded for completing such an intelligent signing. Comparisons to City cult hero Georgi Kinkladze weren’t far-stretched either. The Brazilian regularly enchanted Blues in the least Brazilian way. He had little time for fancy tricks and flicks and other meaningless skills. Instead his play consisted of cutting passes, creativity and the ability to hit a mean free kick as exemplified against Newcastle in 2008 – a stark contrast to Robinho. Elano was also a penalty specialist, leaving City with a 100% conversion rate. Elano racked up a respectable 10 goals and assists in his first season at City, raising huge expectations of himself and City for next season. Under Erikens’ tutelage, the Brazilian shone for City during his first year there, establishing himself as a key part of the side alongside club captain Richard Dunne. His second and final year however was, unfortunately, not as fruitful as Mark Hughes replaced Eriksson that summer in the hope of taking Manchester City onto the next level. And Elano, coming off the back of an exceptional debut season, expected to be an integral part of that future. However, Shaun-Wright Philip’s return and the high-profile transfer of fellow Brazilian Robinho meant his role in the team suddenly became marginalized. Elano instead had to regularly adapt to different positions across the pitch as Hughes, who did not favour him, attempted to accommodate City’s new influx of expensive players. But was the manager right to cut his career in England so short? After all, Elano was still one of City’s best players and a senior Brazilian international. It’s widely believed that Elano attempted to undermine Hughes by staging a dressing-room revolt, so in retaliation Hughes ousted him in the hope of getting the best out of £32m Robinho. But most significantly it appeared the embarrassment of riches that were available to Hughes was the prime factor in his departure. Hughes realised that with a huge budget at his disposal, Elano was no longer a vital commodity. City, already under ownership of Sheikh Mansour, had the economic prowess to easily replace a player of Elano’s calibre if they wished to, so it was little surprise to see Elano leave for Galatasaray that summer for £6.5m. Elano is still remembered fondly by Blues to this day and for all his trouble, he still proved himself in league that is notoriously tough for Brazilians. Maybe it was his lack of ‘Brazilian-ness’ that was the reason behind his sterling performances. Instead of showboating like a Robinho or an Anderson, he utilised his footballing brain and clever passing to adapt in England. You should also note that Manchester City’s Brazilians have rarely been successful; Robinho, Jo and all the way to Geovanni. You’d be hard stretched to find a Brazilian who left Manchester City a success. Elano, however, stands alone. A shining beacon of light in a dark room full of Brazilian disappointment. It’s no surprise to learn he still, to this day, holds a special place in many Manc hearts. This entry was posted in The Samba Series and tagged brazil, elano, manchester city, mark hughes, robinho, samba series, sven goran eriksson by The Samba Series. Bookmark the permalink.